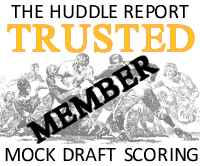 The following three draft-eligible players are the best I’ve seen this year. A lot can (and will) change. But these three have played at a consistently high level and have every chance to work into the top range of prospects for 2015. Still the best candidate by far to go first overall. If Oakland ends up with the top pick they should start Derek Carr next year and let both players compete. Mariota can be as productive as Colin Kaepernick. He hasn’t quite got the same arm strength — but he might be more accurate. Cool, calm and collected — and a big time playmaker. Just a terrific player. There’s no point marking him down because of the failure of previous running backs drafted in the top five (eg Trent Richardson). Gurley is a massive running back but he plays with light feet. Very few runners with his size possess this kind of home-run hitting ability. He’s a rare talent and has really improved in 2014. A dedicated leader and thoroughly mature individual. Collins is the captain of the LSU offense and deserves so much more attention. He could be a perennial Pro-Bowler at guard but has shone at tackle this year. He’s an accomplished run blocker who never gets flustered. The best 2015-eligible offensive lineman and for me — it aint that close. I could’ve added more players, but these are the 32 I wanted to comment on today based on what I’ve seen during the 2014 season. This is not a big board. Some of the players listed here won’t get close to the first round. Another big character guy with a ton of talent. I’ve spent the last three days watching his tape and it’s time to get on board. Dupree combines a relentless attitude with great speed off the edge. He can act as a LEO, work into the 3-4 or just play as an orthodox edge rusher — even at his size he sets the edge nicely. Explosive. He’s back to his best this year and the way he burned off those Tennessee defensive backs at the weekend showed a blast of speed that’ll really bolster his stock. He’s not a prototypical #1 receiver with great size, but he’s a natural receiver who shares some of A.J. Green’s innate ability to play the position. Could be the next Reggie Wayne. Oakman has drifted in and out of Baylor’s key games this year and struggled to make an impact against TCU and West Virginia. And yet there simply aren’t that many human beings with his size and athleticism (6-8, 280lbs). He has to be a high pick based on the insane ceiling he possesses. He’s a better prospect than Ziggy Ansah. 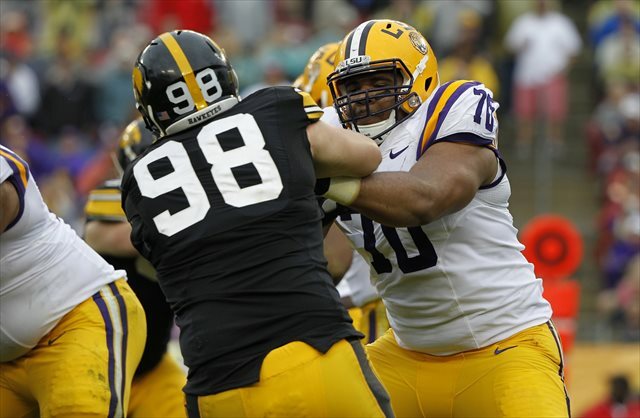 He’s the next best offensive lineman after La’el Collins and the most natural left tackle. Unlike Cedric Ogbuehi and Brandon Scherff, Peat is actually a competent pass protector. He’s technically quite accomplished and just needs to avoid lunging. He has ideal size. He’s not a great run blocker like the others, but he’ll start at left tackle for several years. Great speed off the edge and production to die for (29 career sacks in as many games). Beasley’s been a terror for three seasons now. He doesn’t have great length and this will be a slight concern. He chose not to declare for the 2014 draft. His get-off, competitive edge and third-down capabilities will attract a lot of interest. How many defensive prospects get bumped to running back for a full game? That happened to Thompson at the weekend. He’s just a fantastic athlete and a thoroughly modern day first round pick. He has multiple defensive touchdowns this year and will be a high pick. The NFL draft seems to churn out super-athletic linebackers ever year these days. Thompson is the next in line. He glides as a runner with long graceful steps. He looks like a gazelle. He’s added good weight over the years without losing a step — but he’s still not a great between-the-tackles runner. The extra blocking duties this year will be a big help to his stock. He can be a real X-factor at the next level as a runner and receiver — but can he get the tough yards inside? Part of a big-time tag-team with the next name on this list. Ray knows how to get to the quarterback — he can rush the edge, stunt inside and he plays with his hair on fire. He’s not the biggest and won’t be a measurable king — but he just has a knack for making plays. The question is — does his game translate to the next level? If it does, watch out. He’s been slowed a little by a nagging hamstring strain — but that hasn’t stopped Golden sacking QB’s, scoring touchdowns and making plays. He’s a terrific athlete with great size and balance. He’s better than Melvin Ingram was at South Carolina. He’s the only player who gave first round pick Ja’Wuan James a problem in 2013. As much as you want to knock him (and I do) for all the off-field nonsense and controversy — he somehow manages to stay focused and perform. He’d be a better option for at least 10-12 NFL teams compared to their current starters. In a cultured, pass happy offense he will put up big stats. But can you trust him? If you want to know why Miss State is doing so well this year, here’s one key reason. McKinney could be the player Rolando McClain was expected to be at Alabama. He’s got the size to play inside linebacker in the 3-4. Hits like a sledgehammer and quickly closes any running lanes. What’s not to like? He has the size and speed, he high points the football superbly. He’s had an impact in every WVU game this year — even in blanket coverage. What’s more he’s quickly becoming the heart and soul of the Mountaineers offense. Nobody has done more to improve their stock in 2014. ‘The human cannonball’ — and he plays that way. Robinson is short and squat with tremendous lower body power and enough speed to keep a defense honest. He breaks tackles, fights for extra yardage and still makes big plays. He’s a bit like a more compact version of Michael Turner. Nobody has more sacks in the NCAA (14.5 so far). He isn’t a special athlete and by the time the combine comes around, he might struggle to maintain the obvious momentum he currently has. And yet he just finds ways to sack the QB. His play this year demands respect. It’s not that I don’t rate Williams. He holds the edge well and does a good job swatting at the ball. He has some nice athletic qualities for his size and the way he played through the pain against Stanford was admirable. And yet he doesn’t live in the backfield, doesn’t look like a brilliant 4-3 DE or three technique. If he’s best at the five, what does that mean for his stock? He’s not been at 100% all year and that’s perhaps limited his ability to make waves this year. He’s a brilliant looking prospect in pads — tall, lean without being skinny and he moves well for the size. The thing is, he’s a better blitzing linebacker than a pure pass rusher. For me he’s strictly a project if you’re thinking 4-3 DE. The Gators are a shambolic mess and it’s had an impact on Fowler’s performance. With a productive supporting cast he had a chance to compete for a top five spot. He can still regain momentum at the combine. Fowler is an active, versatile pass rusher who can line up inside or out. Does anyone consider him a left tackle prospect any more? He’s struggled all year conceding nearly double digit sacks. A return to the right side could be inevitable. It’s hard to imagine he’ll go as early as some people are projecting. He needs a lot of work. Run blocking? Perfectly acceptable. Pass protection? Stiff, awkward and asking for trouble. He’ll punish you head on and he loves to drive people off the spot in the run game. But even at the college level he looks like a future liability in the passing game. He might be limited to a spot on the right or even at guard. Big nose tackle prospect and you have to love the way he plays the game. Brings the attitude every week with a real mean streak. Pushes people around. Is he a good athlete for the size? That’s the key question. Big guys who aren’t special athletes don’t go much higher than the middle rounds, even if they’re good. If he turns a few heads at the combine — his stock will sky rocket. You can’t argue with his production and ability to ‘wow’ with big plays. He’s a very patient runner. However, he just looks like a player with a limited role at the next level. He’s not an every down back at 5-9 and 190lbs. He’ll need to make the most of his snaps. Prediction? He’ll start as a 6-8 carry player with potential and eventually fade away. Not a good year so far — and he had a few tough days last season too. Can he really play outside? Or is he limited to working in the slot? Teams are willing to take slot corners early these days. He could still be a first round pick in that role, but he’s not lived up to the lofty expectations. Another big nose tackle. He flashed rare athleticism on a big-time fumble return early in the year, sprinting the length of the field for a score (the play was called back on a lousy penalty call). He plays on a pro-ready D-line and that helps, but he’s made some key plays rushing the passer too. Phillips had injury problems last year (back). Looks a bit like Aaron Maybin. Too lean and needs to add weight. Nobody doubts his potential but the best thing to do is return next year, add core strength and get another year in the SEC. He has a great get off but he can’t shake a block, he has no counter. At the next level he will be found out unless he improves. Ideal size to be a #1 (6-4, 235lbs) and he has experience at tight end and receiver. He does a good job working the seam, making the most of a physical mismatch and he provides a nice big target for the quarterback. However — he doesn’t really do anything well technically and he has too many mental errors. The potential’s off the charts, but he might look better than he is. You could argue it’s difficult to judge him in a miserable Michigan offense. At times he looks physical and gritty — but he will give up plays too. He’s Marshawn Lynch’s cousin. He’s been involved in too much drama and he’s missed games as a consequence. There’s no doubting his potential and with the right coaching he could easily start in the NFL. But how concerning is the character stuff? And can he be more consistent? I’ve watched several Michigan State games over the last two years — and at no point have I ever come away impressed with Calhoun. He just looks, well, a bit soft. He got pushed around in the Big Ten Championship last season and the same thing happened at Oregon this year. I’m not sure what all the fuss is about. Who expected DeMarco Murray to turn into a dominating power/speed back? At Oklahoma he was more of a receiving option out of the backfield. You could kind of see Yeldon developing into an effective runner over time. He’s a former 5-star recruit, there’s definitely something there. But it’s so much more fun watching Derrick Henry run the ball. Yeldon’s one to watch, but he might be a bit of a gamble. He’s not an up-the-gut runner. It’s hard to imagine him carrying the rock with any authority at the next level. He’s more effective in space as a pass-catcher. His best role in the NFL might be as a return man or third down back. It’s hard to get too excited, even if you have to love a ball-carrier with the name ‘Duke’. Great piece. Id love the hawks to get Oakman or Gregory but i think they’ll be long gone. That’s a good deal defensive talent. I know this isn’t a big board but do you a real disparity this year in terms of numbers of quality defensive players vs. Offense? Brutal comment above! Sorry Rob. Too early in the pacific NW I guess! If you could decipher above I was attempting to ask if you felt there was much more talent defensively this year then on offense? I watched the Utah/UCLA game and thought Orchard benefited a ton from shocking pass pro and a QB who needs an age (Brett Hundley) to get rid of the ball. He had a huge day but personally thought it was more on UCLA than his talent — but I will watch him again. On Strong — I wasn’t a fan at all last year. I haven’t seen him this season. People like Tony Pauline say he’s improved. I’ll check him out. Jalen Strong made life miserable for the Huskies!!!! The Seahawks seem to like LSU players – maybe if Collins isn’t a top 15 pick, there’s a chance. Top five for me. Man what a player. Thanks Rob, for the impressive list. Now I’ll have some names to watch for during the games. I think there will be more good players coming out of Ol Miss and Miss State this year. I remember Damontre Moore from A&M being touted as a top 5 pick before the combine and then having his stock crash after. Not saying Kikaha is being touted as such a high pick but could his stock fall similar to Moore’s despite their production in college? I think they are different players personally. Moore didn’t prepare at all for the combine in one of the single most pathetic performances you’ll see by a future pro. Kikaha won’t take anything for granted. I’m not sure he goes in round one but he won’t make the same bone head mistake as Moore. Rob Staton on Kansas City Chiefs to trade for Frank Clark?